We were at Dholavira, one of the five largest Harappan sites. The details that had gone into planning and building the city are mind-blowing. However, I’ll save it for a different post, because something else caught our eye in the dry and arid region. It was slithering and shining, the sun rays dancing on its reddish brown body. It didn’t stop for a moment, disappearing behind the scrubby vegetation. It seemed to live up to its characteristic feature, almost saying “timid and shy and scared am I, to face a world of men”. Obviously scared, because men (read: humans) aren’t really being nice to it. “Domuha saab, domuha!” shouted the driver. 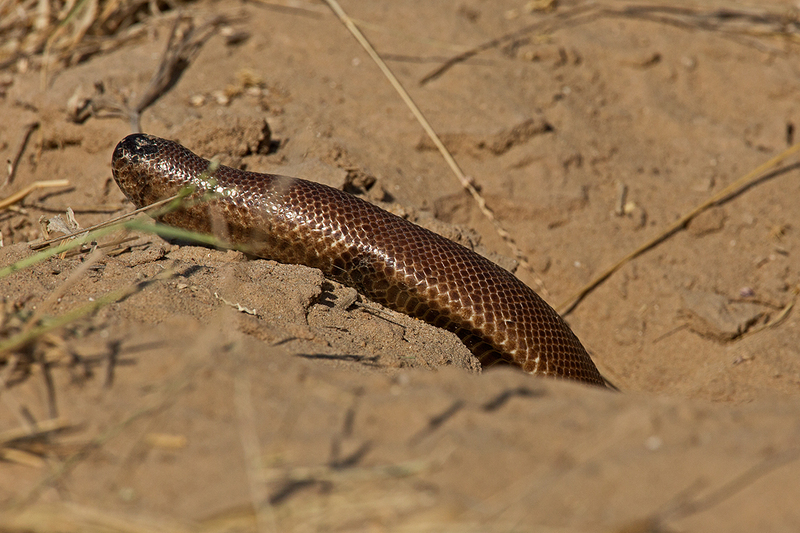 One of the local names, in Hindi, for the Red Sand Boa is do-muha, meaning two-headed snake. That is exactly what it is not! This snake has a rather blunt tail, which cheats the onlooker to believe that it has two heads, one at each end. The tail is usually slightly darker than the rest of the body. The burrower that it is, it went in and out of burrows, until it finally decided to stay put in one. 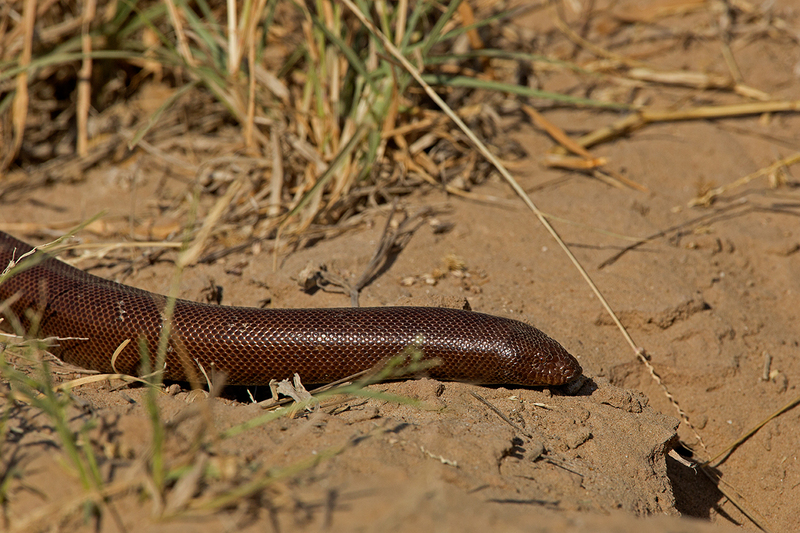 Red Sand Boa is said to be nocturnal, but we don’t have an inkling into why it appeared in broad daylight. Did you know that this is an ovoviviparous snake? The eggs hatch inside the female’s body. So what’s so interesting about a slithering beauty, that isn’t venomous, and does not even have a record of having bitten anyone till date? I started reading more about the Red Sand Boa. Kerala 2014. Chennai 2014. Hyderabad 2014. Mumbai 2014. Coimbatore 2012. Bangalore 2010. These are just some of the dates when harmful creatures (again read: humans) were captured, because they had in their possession these absolutely harmless Red Sand Boas. These are instances when action was taken, but who knows how many cases go unreported? A report says that at a time when the real-estate business took a hit (yes, such a thing does happen sometimes in India), the businessmen began looking out. Not for an alternate profession, not for alternate strategies, but for Red Sand Boas! One of the many myths surrounding these snakes is that they bring luck. Yeah, right. Its “luck” can barely save its own life! Oh wait, luck is not the only reason. The gullible, senseless, heartless people want the snake as an aphrodisiac. Every animal in our forests seems to have “aphrodisiac powers”. And then there are the black magic practitioners, who promise that these snakes act as guides to find hidden treasure. “Do you want a juvenile, or a hatchling male? Maybe a pair?” “Does anyone have a Double Engine? I want 4.5 kgs, any number of pieces that you have.” “I want it for agriculture.” “I want it as a pet.” “Call me on *******, name your price.” These are comments that appear on websites that trade in snakes, and even on YouTube. Just Google for Red Sand Boa and be ready for a shock on how open this trade is. People readily give away mobile numbers, stating their eagerness (desperation ?) to sell or buy. Here’s one of the weirdest myths. According to some retards, a long long time ago, an iridium isotope fell on earth. Somehow the iridium made its way into the tissues of the Red Sand Boa. Voila! You have instant access to a bit of magic and supernatural powers. This “bio-iridium” doesn’t stop just there. It now automatically becomes a rice puller. “Rice what ?” did you say? Rana and I sat with our jaws touching the floor, reading all this material. 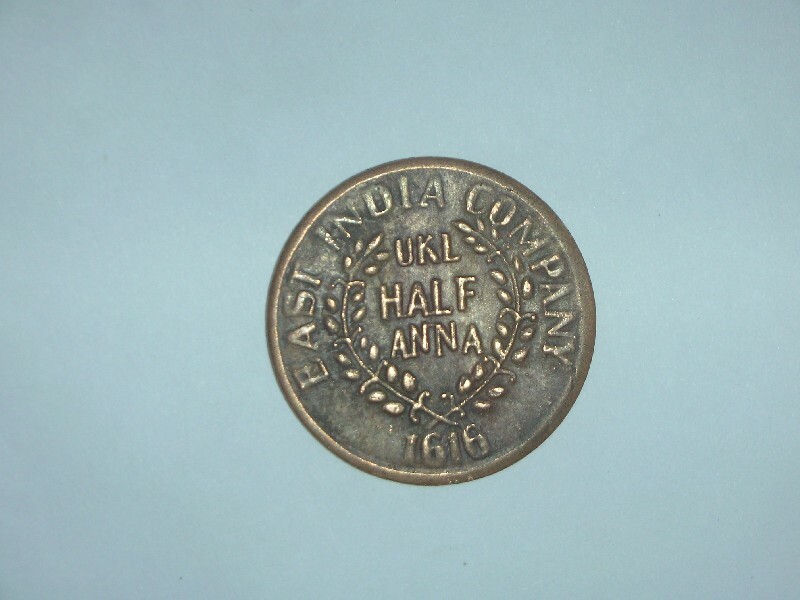 The “story” goes that around 1616, the East India Company manufactured crude coins. Made of copper-iridium, these coins were rice pullers, literally pulling rice. While these coins are the “most prized rice pullers”, supposedly there are also utensils, jewelry, statues and Red Sand Boas. But why would anyone want to “pull” rice? The superstitious fools equate it to pulling wealth. Iridium-based alloys are said to attract rice or any cereal, due to the inherent property of iridium being able to attract the negative charge in the hydrocarbons. I am not stating any fact here, this is what I have read. And the poor snake is caught in this baloney. I haven’t found any scientific reference for the presence of iridium in boas. Frightening to read these? It has been scarier to write about it. There are huge gangs operating around this scam, conning people that they can become rich overnight. The price for a snake runs in lakhs if sold locally, and crores internationally. If you thought poaching was only about tigers, think again. People are taking to illegal wildlife trade to make a quick big buck. 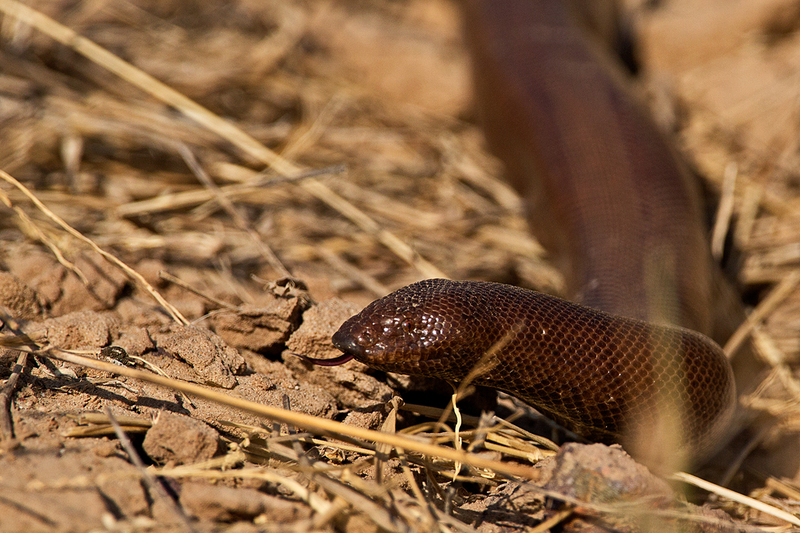 Though the Red Sand Boa is listed under the Wildlife Protection Act, 1972, it is one of the most sought after. I have written more about the dangers it is facing. This is with the hope that when you hear about such superstitions, you will educate people against illegal wildlife trade. You may hear about someone wanting more wealth, or your maid may give away her plans to make some quick money, or your native village maybe abuzz with this business. Please educate them. Please report any such occurrence. Thank you. Wish you a happy new year and a great 2015!